What’s So Positive About a Negative: The Good ol’ Days of Film Photography..
Today I took forty-seven rolls of film out of the fridge and placed them in a suitcase. It was familiar. It was nostalgic. It was chilled. (Why put your film in the fridge? That is for another blog, but if you currently have film in your fridge, you just moved up the ranks of my cool-kids-list!) Looking at that unused film, just waiting to be filled with memories, I suddenly realized how intangible digital photography is. Digital storage is an attention whore. It is so much more fun to flip through pages of contact sheets and negatives then to click through thousands of folders and files. Negatives and prints will always be there vs. the constant headache of continually buying more hard drives and transferring “virtual” photographs in hopes that the old drives don’t fail or become obsolete. Not to mention the toll old hardware takes on our environment. Remember the last time you browsed through an old photo album, a scrapbook, or even a shoebox full of snapshots? One simple look leads to hours of reminiscing, outbursts of laughter, maybe even a few tears. Photographs instantly catapult the viewer back in time to converse with lost loved ones. They remind us of when our grown children were babies. They remind us of when we were young. They force us to face how fleeting life is, and how important it is to savor each moment. When was the last time your got out your old floppy disc or CD-ROM to be passed around at the family gathering? I don’t know about you, but this thought does not leave me feeling warm and fuzzy. Have you safeguarded your memories today? As I contemplate the idea of returning to film photography, I want you to think about the generations that will come after you. Will they have a box of memories to revisit when they are missing you? Or will they find an old flash-drive that won’t plug into their virtual computer? 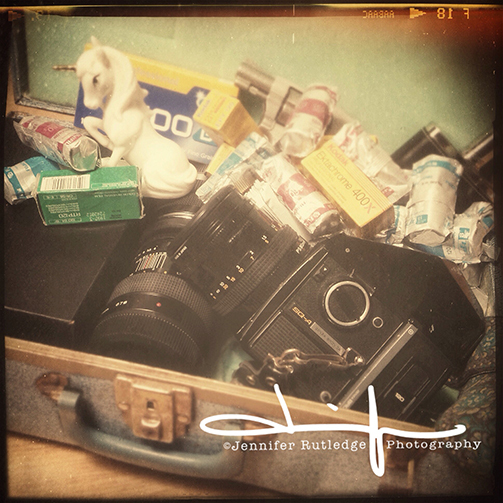 Tagged digital photography, film, film photography, medium format camera, negative | Comments Off on What’s So Positive About a Negative: The Good ol’ Days of Film Photography..